Philip J. Fry as shown in his internet movie. Philip J. Fry II is Fry's nephew and Yancy's son, and best known as the singer of the band Leaf Seven as well as the first man to walk on Mars. Philip II was first exposed to spaceships as a newborn baby when his father hung Fry's picture of him on a spaceship. Little did Yancy know he was raising one of the world's most famous and influential men, with the help of his uncle Fry's lucky seven-leaf clover, which he was given as a baby. He eventually grew up to become a world-renown philanthropist and entrepreneur. His first brush with fame was when he struck oil in a mansion he won in a lottery. He later went on to have a fling with international super model Njörd. Later he had a string of top 10 hits with his band Leaf Seven. Although he did many great things, his greatest accomplishment was being the first man to walk on Mars. His father, Yancy Fry Jr., named his son after his brother, who had disappeared several years before. In memory of his brother, he gave his old seven-leaf clover to his son, and it later became his trade mark. Philip's uncle visiting his grave in the Orbiting Meadows. Philip rests in Orbiting Meadows National Cemetery. Either he, or an unnamed sibling, is a direct ancestor of Professor Farnsworth. Originally, Philip J. Fry II never would have met his uncle, but this changed because of the events of Bender's Big Score where the time-paradox duplicate of Philip J. Fry that became Lars Fillmore was around between 2000 and 2012. 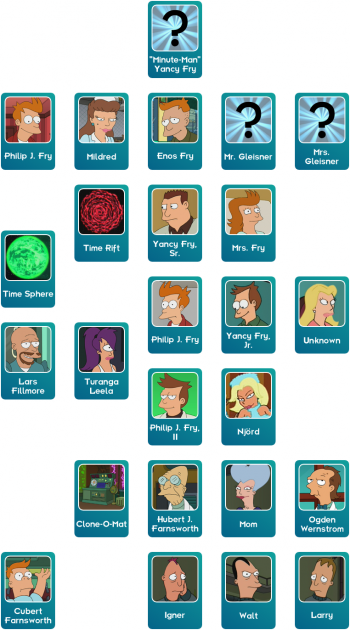 These events rewrote the life of Philip J. Fry II as defined by "The Luck of the Fryrish". As a result of Philip J. Fry's return, it is possible that Philip J. Fry, II either never received the seven leafed clover or instead was given it directly by his uncle rather than by his father. It is also likely that he was named after Philip J. Fry for different reasons, as given his return Yancy Fry, Jr. would not have had reason to miss Philip J. Fry. It is possible, however, that the disappearance Yancy Fry, Jr. was referring to was that of his time-paradox duplicate in 2012, after Bender destroyed Panucci's Pizza. 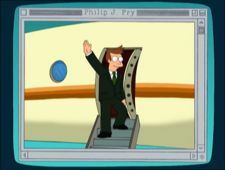 Another possibility is that Philip J. Fry II was born after Fry went on his expedition to capture Leelu. Since it is never shown that Fry told his family where he was going, it is likely he was considered "disappeared". However this theory also has an inconsistency, when Bender goes on his mission to kill Fry he visits Yancy Fry, Jr. and speaks to Philip J. Fry II, who tells him that Fry is at the North Pole, Bender goes to find him but sees him before he travels to the North Pole, so Philip J. Fry II couldn't have been named for the 2012 "disappearance". After being played by Lauren Tom in Bender's Big Score, he became one among few Futurama male characters voiced by a woman. He was likely born around 2007 because when Bender came to kill him in 2012 he was about 4-5 years old. Yancy Fry, Jr.: Phil, some kind of trash can here to see you. He's coming. Philip J. Fry II: Are you made of Tinkertoy? Bender: Hmmm..... It's been twelve years. Maybe I'm getting taller. Philip J. Fry II: You're not getting smarter. Bender: Listen, pipsqueak, are you Philip J. Fry or not? 'Cause if you are, I'm here to kill you. Philip J. Fry II: I'd like to see you try. Philip J. Fry II: [screams] You want Uncle Phil. He went to the North Pole on a fishing boat. Bender: Ahhhh! The North Pole? I was just there. This page was last edited on 31 July 2017, at 15:32.